The artist who is singlehandedly trying to resurrect everything analog gives listeners an acoustic tour of his music. I hope you know Jack White. Not personally—although I hope you do know him personally because that's the dream, isn't it? Really, I mean I hope you know Jack White's music, and have listened to it and loved it and wondered at it and cried to it. He's an artist who's not satisfied with the present state of things, not because it's bad, necessarily, but because he can see how it can be so much better. Yes, part of this is because he sees the way some things used to be better. At concerts during White's Lazaretto tour, an announcer would come on stage before the band started to ask everyone to please, put your phones and cameras away and live in this moment, because we have a professional photographer here tonight who's going to put all of his pictures online for free after the show ("And," he didn't say out loud, "they're going to be so much better than your pictures, anyway"). He made Lazaretto without any digital compression, recorded some songs in one take, directly onto vinyl, and told Conan O'Brien all about his frustrations with technology. But Jack White is also looking to the future. With that in mind, let's talk about Jack White Acoustic Recordings 1998–2016, a retrospective look at his career since the beginning of The White Stripes until the present. If you know Jack White—and like I said, I hope you do—then you already know these songs. Most of them. The double album contains twenty-six songs in chronological order that nicely span the eighteen years in the title. 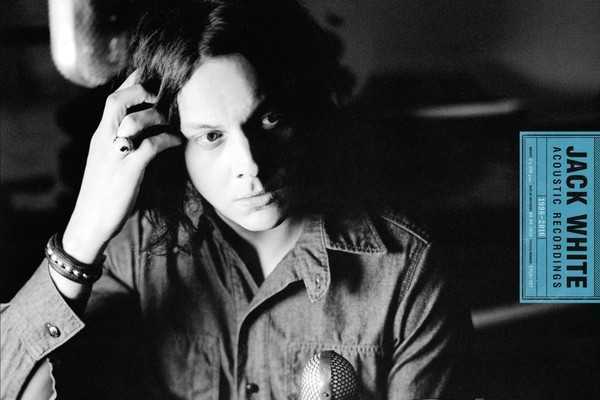 It features songs from The White Stripes, The Raconteurs, and White's solo bands from Blunderbuss and Lazaretto. It also introduces some rarities, remixes and an unreleased White Stripes track, "City Lights," a beautiful, spiraling, hypnotizing journey home. The album starts with "Sugar Never Tasted So Good," from The White Stripes' second single. Remixes of "Apple Blossom" and "I'm Bound To Pack It Up" introduce more early White Stripes material before the album's centerpiece, "City Lights," which was written for 2005's Get Behind Me Satan but disappeared until 2015's Record Store Day reissue. White finished it this year for the acoustic album. Other favorites shine in their original form, like "Forever for Her (Is Over For Me)," "Love Interruption" and "Blunderbuss." Also included are alternate mixes of "Hip (Eponymous) Poor Boy" and "I Guess I Should Go To Sleep," and fantastic acoustic mixes of "Love Is The Truth," the amazing "Carolina Drama," "Machine Gun Silhouette" and the full version of the acoustic "Just One Drink" that appears (at least the first half of it) on the Lazaretto Ultra LP. The new album ends with White's latest songs from Lazaretto (although "City Lights" is technically his newest release, and the first new White Stripes song since 2008). The tracks, "Entitlement" and "Want And Able," wrap up the album with thoughts on modern attitudes toward work, wealth and acceptance of inequality. This isn't an end-of-career greatest hits album for Jack White, not by a long shot. His side project, The Dead Weather, released a new album in the second half of 2015. And he's made it clear that he has dozens of unreleased solo songs that we can only hope will make it onto future records. This acoustic history of the past eighteen years is a wide-ranging, evolutionary study of the career one of this generation's greatest artists. And it's only the Acoustic Recordings from 1998–2016: the title alone anticipates more to come, otherwise there's no need for an end date. It the acoustic recordings up to now. That's called looking to the future. Jack's not done.